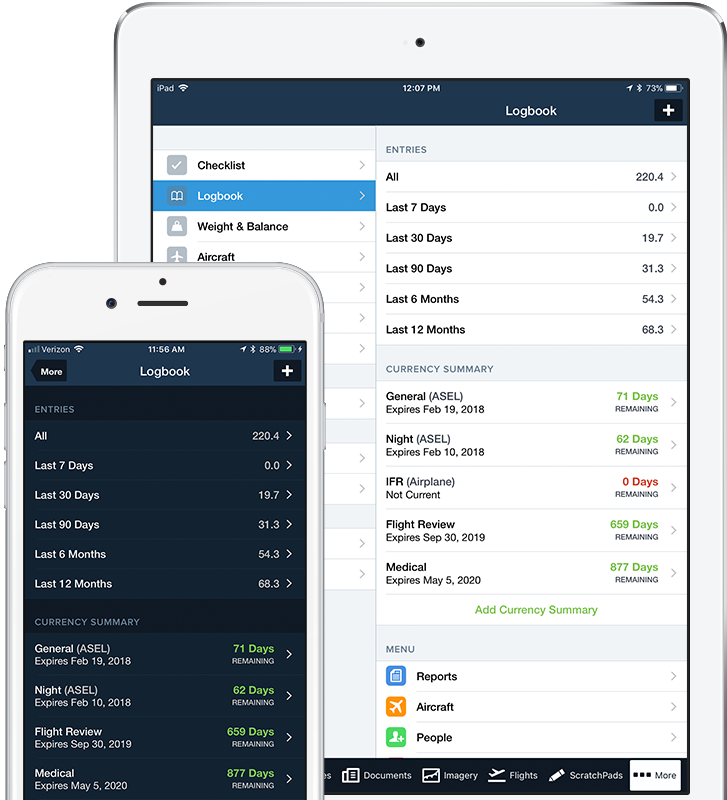 Logbook is built-in to the ForeFlight app, making it easy for pilots to log and share flights, track hours, review currency, record certificates and ratings, receive electronic instructor endorsements, and generate experience reports. 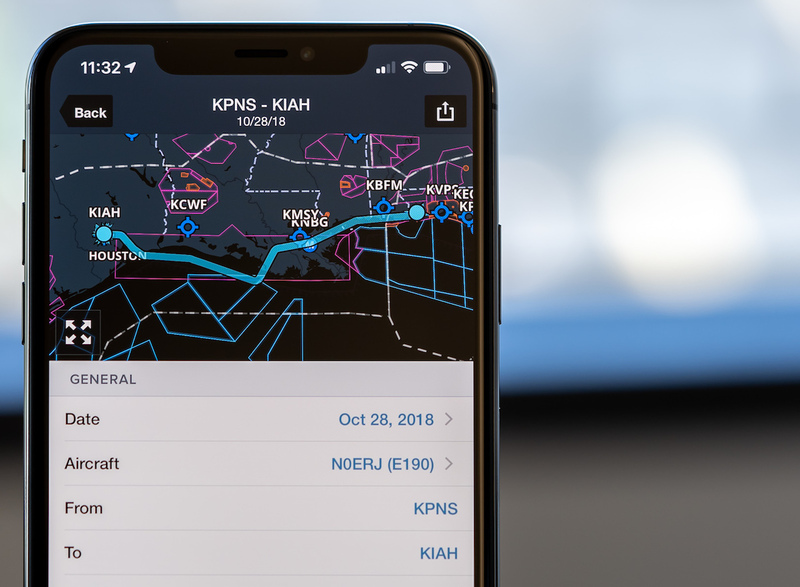 With ForeFlight Logbook, managing your flight logs is easier than ever from within the app you already depend on for charts and maps, weather, flight planning, and inflight situational awareness. Quick Fill buttons anticipate the information you want to enter. Values are staged to simply tap-to-enter or pre-filled, like the ending Hobbs or Tach time for that aircraft, based on the previous entry. Pro tip: Use the Send-To action button in the Route Editor or File & Brief view to prime a new draft flight entry. Never forget an entry! Recorded Track Logs can be set to automatically create draft logbook entries, eliminating the need to manually enter basic flight information like date, total flight time, and route. Simply review the entry, add desired details, then tap to save. Log in to ForeFlight to upload and import logbook entries saved in one of many different supported formats. We also provide a template to help organize your data. For helpful advice on planning your transition from paper to ForeFlight Logbook, check out our blog post on creating catch-up entries. See your flight route on an interactive map for a helpful reference when reviewing entries. The route is overlaid on the Aeronautical Map layer, and you can zoom in to examine your taxi movements on embedded airport diagrams. ForeFlight depicts the actual route when there is a linked Track Log for the flight, or the planned route if no Track Log is linked. 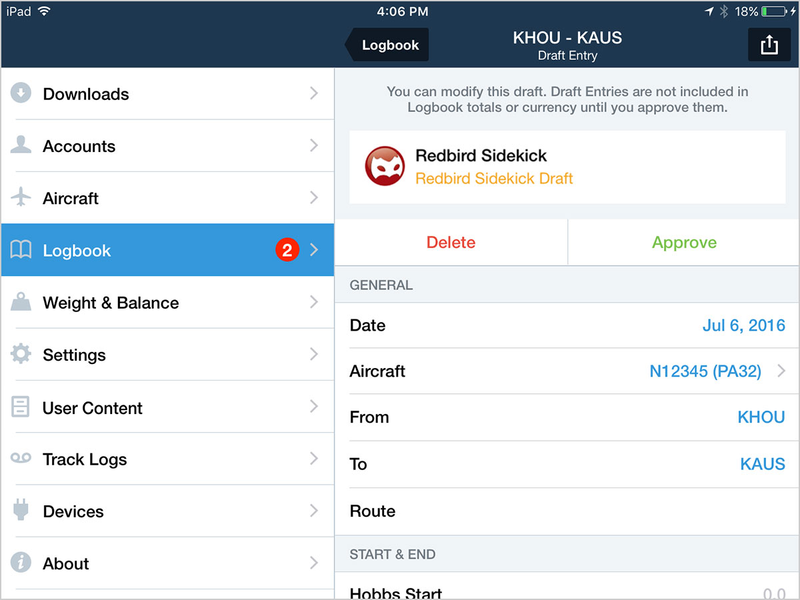 Your pilot logbook data is automatically and securely stored in the ForeFlight Cloud. 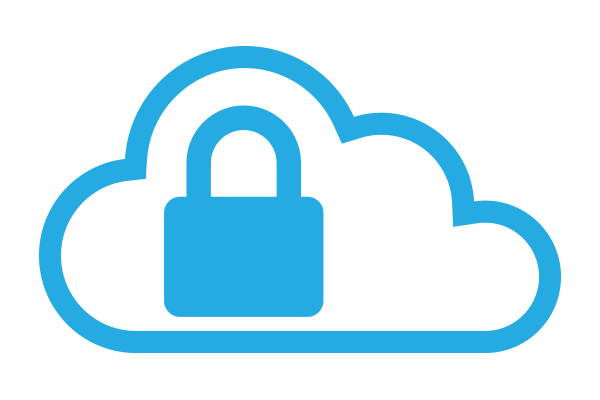 ForeFlight's servers regularly backup your logbook when changes or additions are made, delivering a new level of security and assurance for cloud storage. 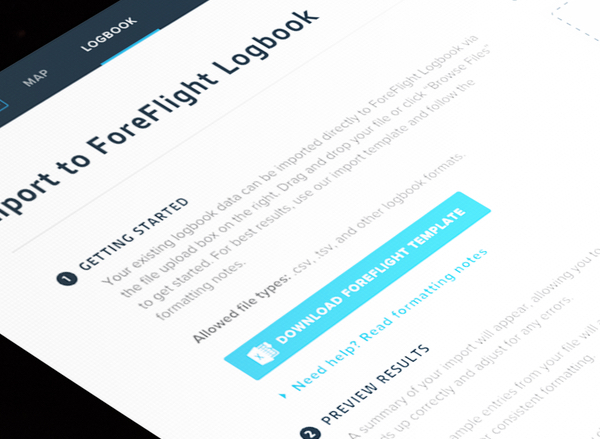 You can export your entire logbook any time you want from the ForeFlight website. ForeFlight Logbook is more than just an electronic record of your flights. It's an interconnected ecosystem of pilot tools and services that makes it as easy as possible for you to maintain an accurate and current record of your flying by connecting your personal logbook with other services you rely on. Flight Sharing makes it easy for you to send draft entries to those you fly with and also post to social media. A time-saver and a convenient feature for CFIs and student pilots. Students can send draft logbook entries to their instructor who can review, send back edits, or sign the entry, whenever and wherever it is most convenient. The instructor can also opt to add the flight to their own ForeFlight Logbook as ‘Dual Given’ time. 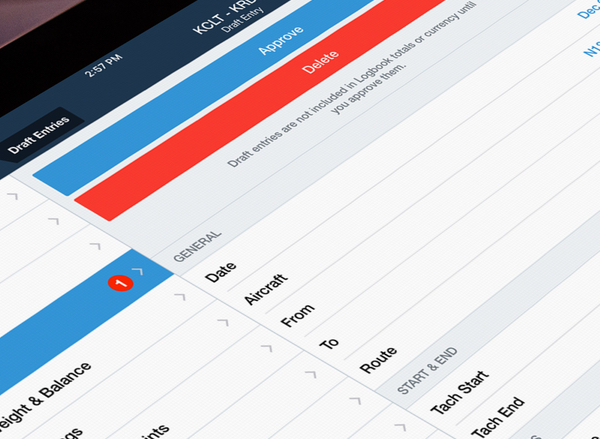 Logbook Connect enables third parties to link their services to the ForeFlight Logbook platform, giving you more freedom to access and manage your logbook data. Launch partners Redbird Flight and Schedule Pointe enable you to send draft entries from their respective dashboards to your logbook. 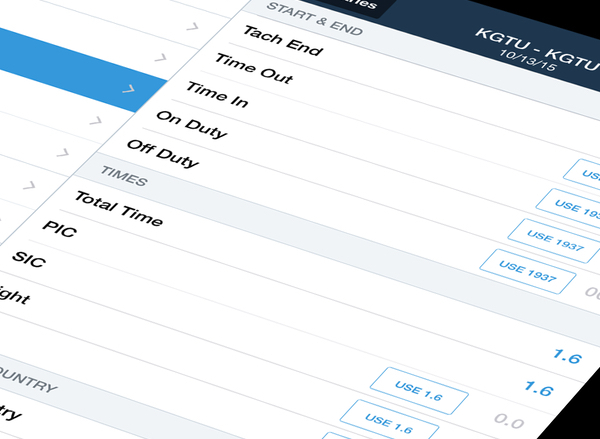 ForeFlight Logbook streamlines the task of filling out logbooks, allowing you to focus on the flight lesson and then collaborate electronically during downtime to complete logbook entries. In the process, students learn to manage their logbook and you can effortlessly maintain your own required training record. 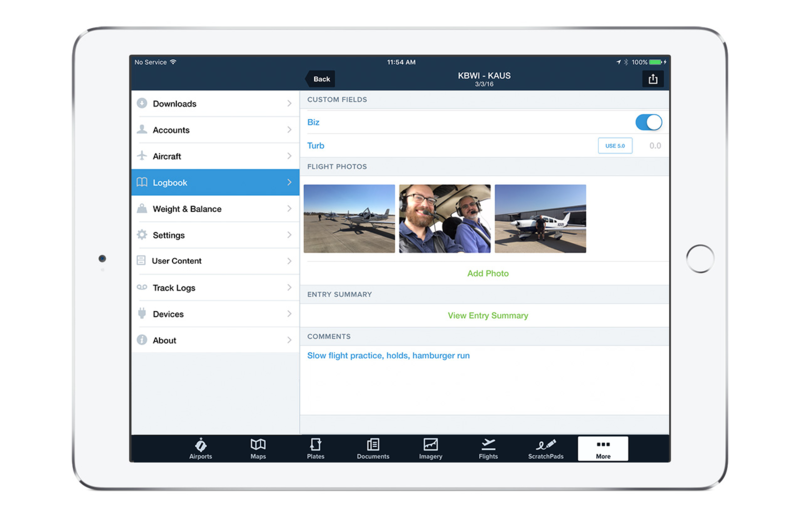 ForeFlight Logbook supports digital endorsements, allowing ground and flight instructors to sign endorsements right in the ForeFlight app using their finger or a stylus. 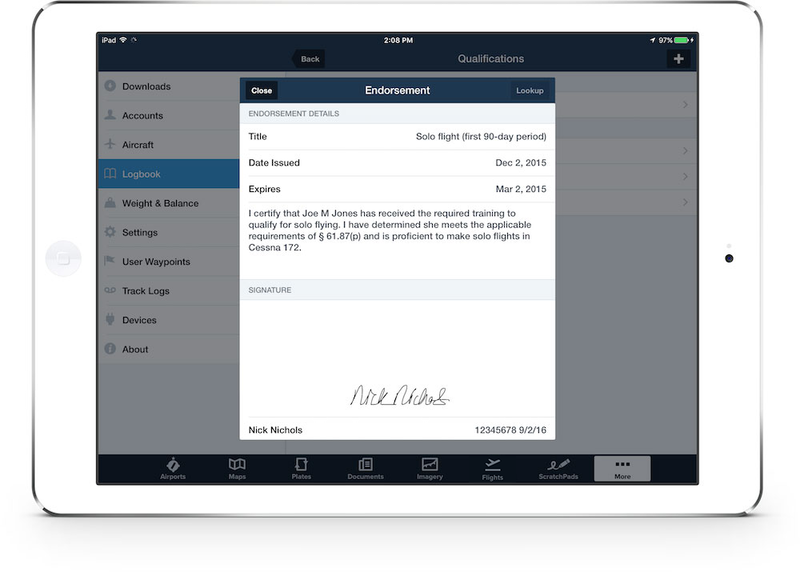 Logbook endorsements and digital signatures are locked and stored in the ForeFlight Cloud for safekeeping. A database of over sixty endorsement templates derived from FAA Advisory Circular 61-65E eliminates the need to type endorsement text, while still allowing the customizations necessary to complete an endorsement. The flexibility of ForeFlight’s digital logbook allows you to keep a thorough and legible record of the ground, flight, or simulator training you give. Use the Crew & Passengers section to add Student information and the comments section to document specific training maneuvers. Logbook provides full support for flight simulators, making it easy for you to log time and update flight currency using four different types of simulators. Flight simulators are seamlessly integrated with the rest of your aircraft in Logbook, and simulated flight time, approaches, and landings logged with a simulator appear in Logbook reports and count towards currency requirements for the simulated aircraft type. Access your logbook data in a variety of ways to stay on top of expiration dates, currency requirements, or flying goals. Reports can be viewed and printed both in the app and on the ForeFlight website. Stay on top of currency for IFR flight, type ratings, carrying passengers at night, your medical certificate, CFI renewal, and more. Logbook automatically flags any missing aircraft profile details to ensure accurate tracking. Filter and export a neatly formatted table of your total times. Flight experience reports are helpful for completing annual insurance forms, rental applications, and job applications. Keep your eye on the prize with progress tracking reports. 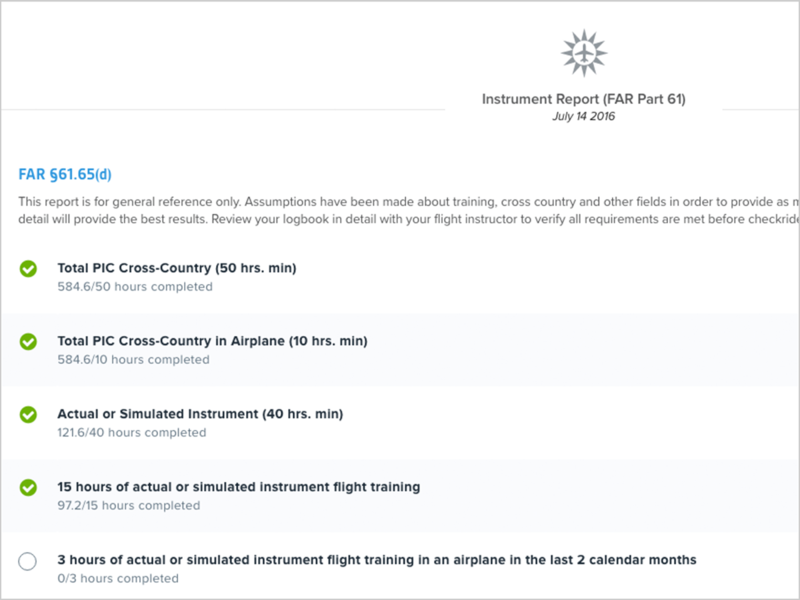 This report helps you keep tabs on your FAA flight requirement progress towards your private pilot certificate or instrument rating. The 8710 report pulls your complete record of pilot time and is formatted just like the actual FAA Airman Certificate / Rating Application. This report is a helpful time-saver that serves as a guide for filling out the application. New Logbook Detail Reports allow you to transform your digital flight entries into a format suitable to print for personal backup or professional job interviews. Each layout includes your endorsements and certificates on separate pages at the end. We've built in lots of ways for you to customize your logbook. Attach unlimited images—from the Apple Photos app or fresh from the device camera—to flight entries, aircraft profiles, certificates, and endorsements. Use photos to capture the view on approach to the runway, keep a visual record of squawks, or capture a shot of you and your passengers. As with all your Logbook data, images are stored securely in the ForeFlight Cloud so you can access them from all of your devices. Show or hide standard fields so you only see the information that matters to you. For example, you can hide duty-time fields if you don't fly for hire. 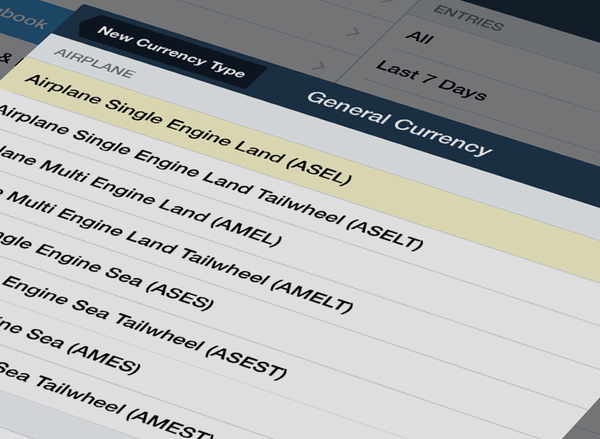 Tap to add and configure as many currency summaries you want to see on the logbook overview. Simply swipe left to delete them. 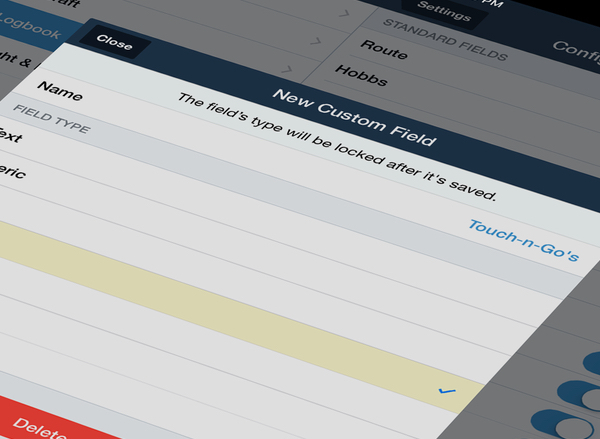 Flexible custom fields give you the freedom to track as much additional data as you like—touch-n-go's, volunteer flight time, personal flying goals, and more. Transitioning to an electronic logbook is as easy as cracking open a new paper logbook—and you can do so much more with sharing, customizing, and accessing your data in lots of helpful ways. Logbook is available as part of our new Basic Plus and Pro Plus plans or as an add-on to existing plans for Individual pilots, as well as an optional add-on for Business Pro multi-pilot accounts. Watch these videos to see how you can get up and running with ForeFlight Logbook.